Home » Applications » Happy Father’s Day from Pacline! Happy Father’s Day from Pacline! 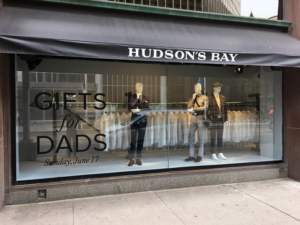 Once again, The Hudson’s Bay and Pacline Overhead Conveyors have partnered to produce a creative storefront marketing display at the Queen St. Flagship store for Father’s Day. 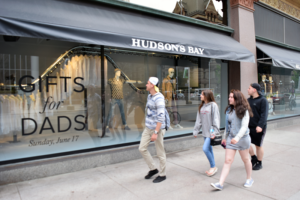 A window display, if done right, can stop traffic and grab the attention of your target audience. And if you really want to catch the attention of all the people who pass by your store, you’re going to have to do something out of the norm. 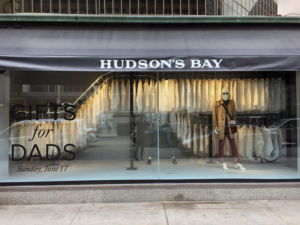 For The Hudson’s Bay, this meant using four large street-facing windows to create a unique and animated display. 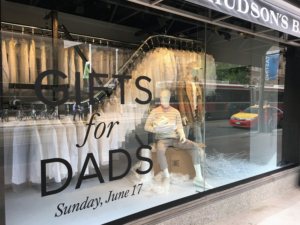 Father’s Day gift ideas were conveyed throughout the windows, catching the attention of pedestrians and commuters passing by. Partner with Pacline on your next marketing window display to increase exposure and grab your customer’s attention!